Looking for alternative history steampunk thriller? This one is steam-powered, alchemy fueled and boosted by the supernatural. The first of six books! Fredrick “Dolly” Williamson is a young detective in the newly formed special crime detection branch at Scotland Yard. When he is called on to investigate the murder of an investment banker, he is reminded of past encounters with the occult and requests help from Rose Caldwell. 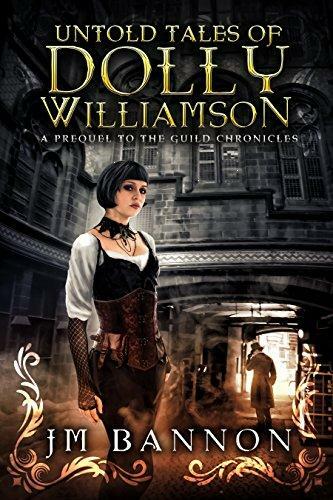 Problem is Rose is an outsider whose very presence grates on the Victorian society she protects from the paranormal threats they want to ignore. Sister Rose an expert in the mystical arts uses her ingenuity to craft devices that straddle the latest scientific and metaphysical discoveries to create defenses against the dark arts.As the body count continues to rise and the mystery deepens after the enigmatic Necronist Guild provide clues to the origins of the murderer. The clues from the secretive French death cult are not enough and Rose and Dolly must reach out to a cast of characters that include a young lord that is possessed by a Sufi mystic from the thirteenth century and an up and coming triad gangster.A tightly wound thriller set in an alternative 19th century where powerful guilds use mechanical power, occult rituals and alchemy to vie for influence in the courts of Queen Victoria and the ever-youthful Emperor Napoleon. Have a look inside now and see if the untold tales is the steampunk yarn for you. What other books have you written and what order should they be read? Why should a reader pick up your book?If they are looking for a series with character driven stories that include fantasy and science fiction but also a nod to history then pick up this book. I love it when a reader writes me that I introduced them to a historical figure they never knew existed and after researching learned that the life they lead was not all that different from how I portrayed them. My rules for the Steampunk world I have built is this is an alternative history to our timeline. Many things are the same, and I use historical characters along with my fictional characters. In this world things happen slightly earlier and better mechanically and there are paranormal aspects along with fervent study of the physical sciences this world had also pursued study of the metaphysical. I like to say it is Urban Fantasy before electricity.